Polyclonal antibodies to PfEMP1 recognize IgM-positive IEs. 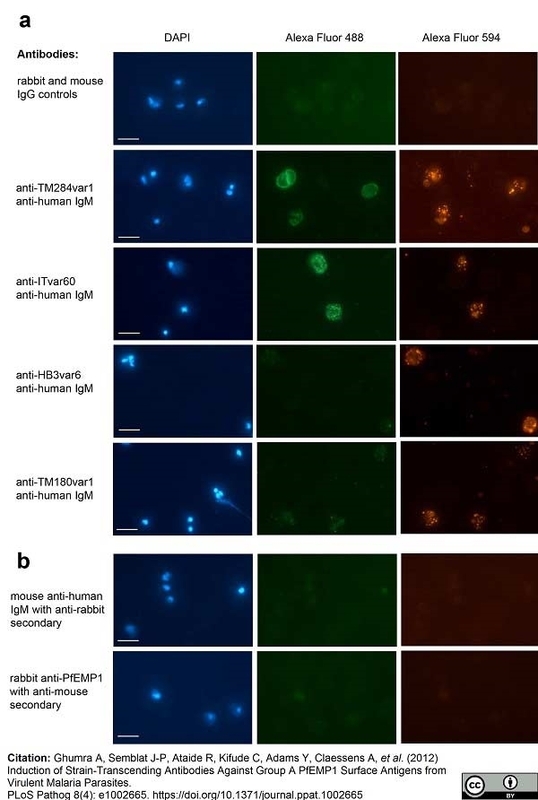 HB3R+ live IEs were stained with a mixture of mouse mAb anti-human IgM (1/500 dilution) and rabbit polyclonal HB3var6 NTS-DBLα antibodies (20 μg/ml) (left column) or a mixture of mouse IgG isotype control and non-immunized rabbit IgG control (right column). Secondary incubation was with a mixture of Alexa 488 conjugated anti-rabbit IgG (1/1000) and Alexa 594-conjugated anti-mouse IgG (1/1000). IEs were stained with DAPI (1 μg/ml; scale bar 10 μm). The PfEMP1 antibodies (left column, bottom panel) stained IEs that were also positive for human IgM (left column, middle panel). Camera exposure settings were identical for PfEMP1 antibodies and controls except for human IgM/PfEMP1 with Alexa Fluor 488 which was taken at a shorter exposure setting (20 msecs) than the control (200 msecs), due to the brightness of the signal. Induction of Strain-Transcending Antibodies Against Group A PfEMP1 Surface Antigens from Virulent Malaria Parasites. Homologous and heterologous polyclonal antibodies to PfEMP1 recognize IgM-positive IEs. a) Parasite strain TM284R+ was stained in a live cell IFA with a mixture of rabbit polylconal antibodies to PfEMP1 (homologous or heterologous) at 20 μg/ml and mouse anti-human IgM mAb (Serotec MCA1662 1/500 dilution). Secondary incubation was with a mixture of Alexa Fluor 488 conjugated anti-rabbit IgG (1/1000) and Alexa Fluor 594-conjugated anti-mouse IgG (1/1000). IEs were stained with DAPI (1 µg/ml; scale bar 10 μm). IgM-positive IEs (right column) show punctate/rim surface fluorescence with both homologous antibodies (anti-TM284var1, 2nd row, middle column) and heterologous antibodies (anti-ITvar60, 3rd row, middle column). 94–100% of the PfEMP1 antibody-positive cells were IgM-positive, and 100% of the IgM-positive cells were PfEMP1-antibody positive. At this concentration TM180var1 antibodies give very faint punctate fluorescence on IgM-positive IEs (5th row, middle column) whereas HB3var6 antibodies are negative (4th row, middle column). At higher concentrations (100–400 μg/ml) both TM180var1 and HB3var6 antibodies stain IgM-positive IEs. b) Specificity controls (with parasite strain TM284R+ as above) show that the Alexa 488 conjugated anti-rabbit IgG secondary does not recognize the mouse anti-human IgM mAb (top row) and that the Alexa 594-conjugated anti-mouse IgG does not recognize the rabbit polyclonal antibodies (bottom row). Camera exposure settings and image handling were identical for PfEMP1 antibodies and controls. Mouse anti Human IgM monoclonal antibody, clone M15/8 recognizes human IgM, binding to the μ heavy chain. The antibody does not cross-react with other immunoglobulin classes. Cragg, M.S. et al. (1999) Analysis of the interaction of monoclonal antibodies with surface IgM on neoplastic B-cells. Br J Cancer. 79 (5-6): 850-7. Irie, E. et al. (2010) Severe hypogammaglobulinemia persisting for 6 years after treatment with rituximab combined chemotherapy due to arrest of B lymphocyte differentiation together with alteration of T lymphocyte homeostasis. Int J Hematol. 91: 501-8. Creasey, A.M. et al. (2003) Nonspecific immunoglobulin M binding and chondroitin sulfate A binding are linked phenotypes of Plasmodium falciparum isolates implicated in malaria during pregnancy. Ghumra, A. et al. (2012) Induction of strain-transcending antibodies against Group A PfEMP1 surface antigens from virulent malaria parasites. PLoS Pathog. 8 (4): e1002665. Semblat, J.P. et al. (2015) Identification of the minimal binding region of a Plasmodium falciparum IgM binding PfEMP1 domain. Mol Biochem Parasitol. 201 (1): 76-82.